When your home or business is suffering from more than a minor plumbing issue that can easily be resolved using DIY methods, rely on our skilled plumbing professionals . At Chandlers Plumbing in Milpitas we are staffed with qualified plumbing contractors who have years of experience in the field. From routine drain cleaning to complex trenchless sewer repairs we’ve got you covered. Best of all, with our same day service option and 24-hour emergency service you can get the help you need any time of the day. Here at Chandler’s Plumbing we pride ourselves on providing each and every customer we serve with the same quality we’d personally demand from a plumbing contractor. 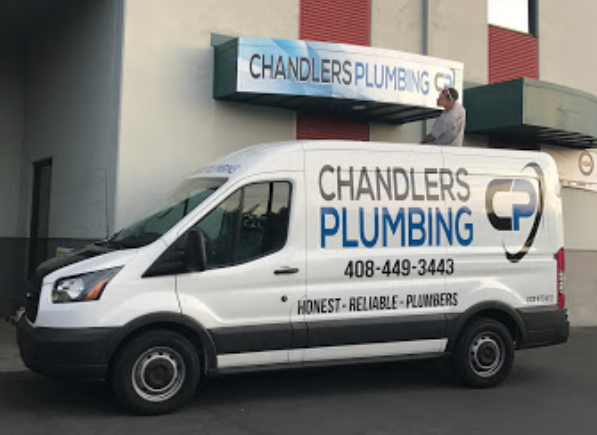 From your initial call, until our final moments on-site at your home or business you’ll experience the difference between Chandler’s and the other plumbers in Milpitas. We’ve been providing quality plumbing services for over a decade. Let us help you with your next plumbing project. What kind of services do we provide? Need Fast & Affordable Plumbing Service in Milpitas CA? Ugh! There’s nothing more frustrating than a toilet that just won’t flush. If you find yourself having to constantly use a plunger to get the toilet to flush, this is an obvious sign that there is an obstruction further down the drain pipe. In some cases, it can be a telltale sign of a much bigger issue such as a problem in the sewer line. An overflowing or leaking toilet is one issue that we’re all bound to face at some point. One sign that your toilet may have leakage issues is if you hear running water for an extended period after a flush. Chances are that water is continually dumping down the overflow pipe or through the valve assembly. This can result in several gallons of water being wasted. If you have an ancient toilet then it may be time for a replacement. Toilets manufactured before 1994 use as much as 3. 5 gallons of water to flush. Modern models are environmentally friendly and have low flow options. Has your bathtub or sink been draining slower than normal? Or maybe it will drain at all? These are symptoms of a clogged or damage drain. Clogged drains can eventually lead to extensive damage such as burst pipes which will result in water damage. Also, a slow-moving drain is likely to attract all types of bacteria which can be harmful to one’s health. Professional drain cleaning will help keep your drains in the bathroom, kitchen and the basement flowing smoothly. When you flip the switch if you hear a humming noise its likely that something has gotten caught in the impellers or the shredding ring. A leak can occur in several different places on a garbage disposal. A leak can occur at the top flange, at the dishwasher connection or the discharge connected to the drainpipe. If you don’t hear any noise coming from the disposal its likely that there is no power. Our plumbing technicians are experienced at uninstalling the old disposal and connecting the new one. Installing a new disposal requires skill because often the new disposal is likely not to properly match the old connection site. We can help you determine which water heater is best based on your budget, your home’s water heater needs, and energy usage expectations. Also, our experts are capable of installing any water heater brand including a tankless or conventional water heater. The bathroom is one of the most important areas of the home. Our plumbing experts can take care of your bathroom plumbing needs including bathtub repair job. The bathtub drains to a septic tank or a sewer via drain pipes that are also attached to vent pipes. These pipes are susceptible to blockage or slow draining. If you find that your bathtub drain is backed up then you should check to see if any of the other fixtures in the house are draining poorly. Clogging in the water or drain lines can be caused by many different factors including soap or hair build up. A skilled service technician can identify the exact spot in the pipes where the blockage is occurring and make the needed repairs. In addition, to troubleshooting bathtub draining issues, our plumbing experts can also service shower heads, install sophisticated systems like spa-like water jets and steam systems. At Chandlers Plumbing our technicians are skilled at repair sewer lines without digging up your yard or front lawn. Trenchless sewer line repair is an easier and noninvasive method of replacing or repairing a sewer line. During this process, a new pipe is threaded through the old one which is often referred to as relining. This eliminates the need for intensive labor that is required during a conventional sewer line repair and replacement. It’s also the most cost-effective option because homeowners don’t have to hire a professional fix the damage done to the landscape in a traditional sewer repair project. Typically, a trenchless sewer line repair project can be completed in as little as a day or two. Trenchless technology allows for such a task to done without technical disruptions and delay. Mildew Growth – Mildew lives in moist environments. Water accumulation in the walls or floors can promote the growth of mildew. Wall Erosion – When excessive water seeps through the wall it will cause drywall to rot which is likely to cause the structure to weaken or collapse. Floor Damage – When pools under tiles, floorboards or slab it results in cracks or splits in the home’s foundation and it can lead to the growth of mildew or mold. The main water line is responsible for transporting clean water into your home. Usually, this pipe is installed underground and is connected to your home through the basement wall. Over time the main water line can become blocked or damaged. In fact, an increased buildup of sediment and dirt can result in bad clogging. In some cases, the pipes can even burst due to tree roots or a mechanical issue. When the main water line is damaged it will cause lots of water leakage. Our plumbing experts can determine whether the water line needs replacing or repairing. We’ll also help you determine the best method for making needed repairs. Why should you choose Chandler Plumbing Service in Milpitas for your next project? We are a leader in this industry because our team is made up of plumbing experts who have been specially trained in this field. Our technicians are proficient in completing all types of plumbing service. If you’re dealing with a plumbing issue, contact us today for help.